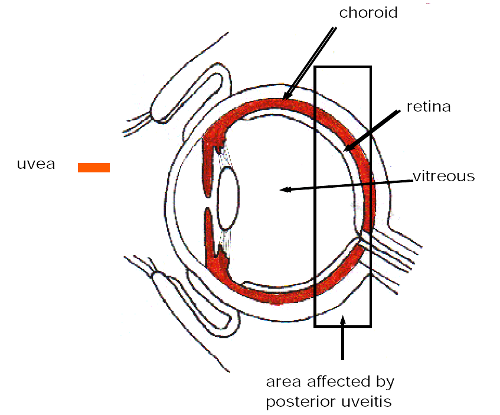 Uveitis is an inflammation of the uveal tract of the eye. The uveal tract is the layer of the eye that contains the iris (the ring with your particular eye color surrounding the pupil), the ciliary body and the choroid. 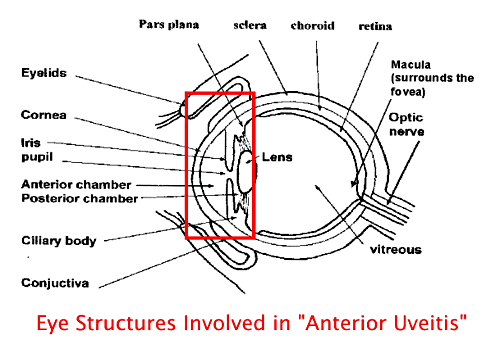 The anatomy and the structures involved in anterior uveitis are illustrated in this link (thanks to www.uveitis.net for this link). The complications of uveitis can lead to permanent loss of vision. Here is a drawing, which indicates the structures involved in posterior uveitis (thanks to www.uveitis.net for this image). The inflammation of the uveal tract can lead to cataracts, retinal detachment, glaucoma, formation of new blood vessels (neovascularization) of the retina, the optic nerve or the iris. Cystoid macular edema is one of the complications of untreated uveitis that leads to a loss of vision. This can be prevented when an eye specialist is consulted promptly for early treatment. This table summarizes the major symptoms of anterior uveitis (formerly called “iritis”). Note that the first three symptoms, the triad of red eye, pain and photophobia are early signs and are so typical, they should ring alarm bells to see an eye specialist without hesitation. The decrease in vision is a late sign that should not develop as with early treatment all of the symptoms will rapidly disappear within 24 hours. With intermediate uveitis there is no pain, it presents with decreased vision and floaters. This is due to the fact that the inflammation is at a deeper level as indicated in the link under the introduction above. With slit lamp examination the eye specialist sees a lot of inflammatory cells and other signs of deeper inflammation, which becomes more evident with indirect ophthalmoscopy (thanks to www.ferris.edu for this image). The advantage of this procedure is that the entire retina can be visualized after the pupils have been dilated. Diffuse uveitis can produce any of the symptoms mentioned above. The eye specialist will do the regular examination methods such as measuring the intraocular eye pressure, using the slit lamp and possibly doing indirect ophthalmoscopy. If autoimmune diseases such as rheumatoid arthritis or ankylosing spondylitis are suspected, special blood tests will likely have to be ordered by the specialist. With certain infectious diseases blood test titers (specific Elisa tests) would be ordered. Treatment has to be specifically directed against the underlying cause. However, with anterior uveitis often the cause is unknown, particularly if it is the first bout (cause unknown in about 70%). 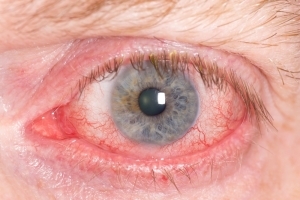 In these cases it is important to treat early with corticosteroid eye drops, typically 1 drop in the affected eye every hour when awake for several days. The eye doctor will want to see the patient again in a few days to reexamine in order to verify that the uveitis is settling and to check that the corticosteroid treatment has not elevated the eye pressure beyond unsafe levels. From then on the corticosteroid drop treatment will be tapered over a few weeks and then stopped. Occasionally a rheumatologist might be required in cases of connective tissue disease. With severe rheumatoid arthritis immune suppressive therapy might have to be added along with the corticosteroid eye drops, which would stabilize the uveitis. If uveitis is due to underlying infectious diseases such as syphilis, herpes zoster, herpes simplex, histoplasmosis or cytomegalovirus, these underlying infections would have to be treated, perhaps with the help of an infection specialist. Not all cases of chronic uveitis can be solved as research has not found an answer to all situations. For instance, birdshot chorioretinopathy seems to be inherited and affects mostly women in their 50’s to 70’s who often have a positive HLA-A29 marker (a special blood test). These patients often end up with a chronic intermediate and posterior uveitis in both eyes. Toxoplasmosis is a parasitic infection that can also lead to a chronic choroiditis and retinitis. This is a chronic condition that needs to be followed along by an eye specialist to prevent retinal detachment and other complications. means that you must see an eye specialist on the same day to rule out UVEITIS!